Blockchain technology is innovating nearly every sector of our lives. The most high-profile is Bitcoin and the rise of the crypto-currencies. In the insurance industry, blockchain technology has the power to change everything we do. In short, we can share everything, have unchangeable records, and still be able to keep our proprietary information secret. So, here’s a quick definition of what insurtech is in the context of insurEco: We’re using blockchain secure technology to share data, protect proprietary data, and hyper-customize insurance in order for smaller brokers and insurers to leverage technology to compete with the (less agile) giants. The more popular cousin of insurtech is fintech. 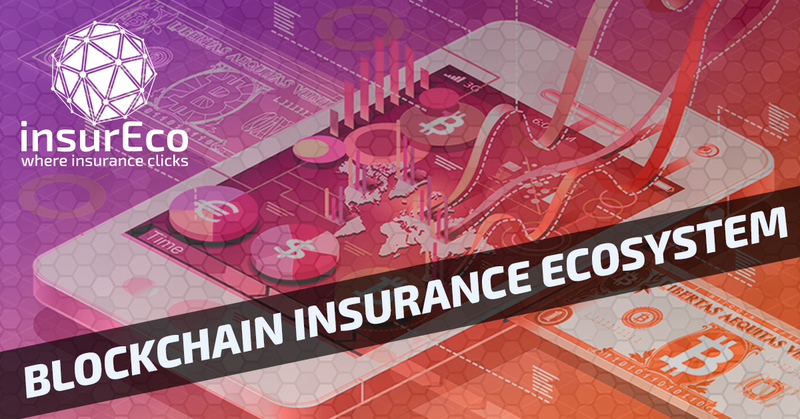 In both cases, new technological solutions and paradigms are being used to disrupt the existing old infrastructure and level the playing field for smaller players against the mega-giant insurance players. While there isn’t a single agreed-upon definition for that term, that’s a great start. What this all really comes down to is giving the insurance customer a seamless experience, the broker a single location for all of the needed tools, and the insurers and underwriters a single resource for everything they need to make decisions. How does blockchain technology figure into this? Blockchain technology is a bit confusing if you haven’t had it explained well. While we can’t guarantee that this isn’t a great definition, here it is: Blockchain is mutually distributed ledger technology that allows everyone to see the data that they’re supposed to. Once something is entered into the ledger it’s permanently encrypted and distributed to multiple storage locations so that there’s no way to change the original data. Updates are reflected as updates, but users can see all of the iterations of the information. OK. Now for the plain English version: If you enter a customer into a blockchain ledger, then you need to go back a week later and add their apartment number, the original without the apartment number will always be there, but the records will show that it has been updated. What this all means is that everyone in the insurance ecosystem, from customers to brokers to insurers to underwriters are able to see the most up-to-date information with assurance that the data trail can’t be changed. What does this mean for customers and insurance pros who work for them? What it really means is that no matter what size your firm from a 1,000 person brokerage to one person, you can all have the same technological advantages and the same military-grade encryption technology. All of the back-office applications and work that needs to be shared at every level of the insurance process can be shared, securely. Furthermore, using encryption and password technologies, proprietary information, at every level, can be secured from competitors. insurEco is an end-to-end solution that allows the brokers to interact with customers, send data securely to insurers, and for all of that data to be stored in an unimpeachable location. RaterSpot - Quotes, UW, rating, and issuance can be entirely automated. PolicySpot - Insurance certificates, a branded mobile app, and policy storage allows customers have access to their information from anywhere. quickPFA - Finance agreements, program pay plans, and loan proposals are all located in the same system making movement between products simple. insPay - Secure, online payments can be handled directly through the gateway, including recording on the blockchain ledger. PDFDoc.io - Compliant, secure online signatures eliminate paper files and guarantee permanent access to records of contracts and obligations. insureBio - Risk data, permissions, and data validation are all located in the blockchain ledger, available for all authorized entities. Submission One - Lead forms, submission tracking, and proposal generation all in one place. Market Ninja - Marketing, including instant rating, are all located in a single place. This is all built on the power of blockchain technology; allowing you to share your existing data from your management system with everyone in the ecosystem. The massive encryption capabilities of blockchain technology marry perfectly with the user experience (UX) of a mobile device. A vital part of the insurance industry that’s missing for smaller players is mobile technology. Everyone has a mobile phone and they use it for everything imaginable, but smaller players struggle to find a mobile solution that really works as well as the larger firms. Using this type of encryption and a white label mobile platform, a branded mobile solution is available that integrates seamlessly with the customer’s information and policies, even giving them instant access to your customer service team. Are there alternatives to blockchain solutions? The only existing alternative is to create a completely proprietary system that integrates the customer front-end, the back office of the broker and brings in the insurers and underwriters, all in a single secure network. While this is the technique of the larger firms, it’s not normally available to smaller brokerages and insurers. Using blockchain security and encryption, it makes it easy for all of the players to share data and still keep their own information secure from competitors and away from those who don’t need to know it. All of this comes down to a simple idea: automation is the best way to keep your business growing. By only entering data once and granting the necessary permissions to the right entities, you can easily push the information that you need to out to your partners in closing the deal and insuring the customer. Because all of this is also contained in a single location, customers won’t find themselves needing to move from one app to the next and can access their entire file on a mobile device, regardless of how many insurers were needed to meet their needs. The move to blockchain seems inevitable simply because it provides a perfect record of everything that has gone before. This security level meets all industry legal requirements as well, making it easy to show that you’ve maintained high standards and have all of the necessary permissions and information. Because the ledger can’t be changed, it’s even more secure than any traditional recording techniques. In short, this is future of insurance - automation, security, and decentralized management, all combined with an outstanding customer experience. To learn more about insurEco System please visit their website here.